Herniation of a nucleus pulosus causing nerve compression can heal spontaneously provided low intradiscal pressure can be mantained for 3 months. 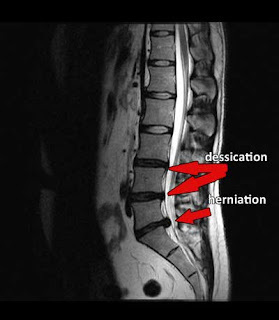 It is commonly accepted that in the treatment of patients suffering from symptoms of herniated nucleus pulposus (lumbar disc lesion), conservative management should be tried before resorting to a surgical procedure. the danger of surgical complications, the certainty that laminectomy will cause damage to the stability of the spine, and the occasional failure of surgical procedures to relieve symptoms indicate the advisability of an initial trial of conservative treatment. Under favorable circumstances the protruded portion of the nucleus pulposus shrinks by dehydration, and the symptoms of the nerve root compression are relieved. Over a period of months the posterior wall of the anulus fibrosus heals by fibrosus,which can result in complete clinical recovery. BUT,if excessive pressure on the disc occurs before healing of the annulus fibrosis has progressed significantly, the tear will recur, additional disc material will be expelled, and symptoms will return or become aggravated. The purpose of a program of conservative management is to keep the intra-discal pressure sufficiently low for a period of time that permits adequate healing of the anulus fibrosus. 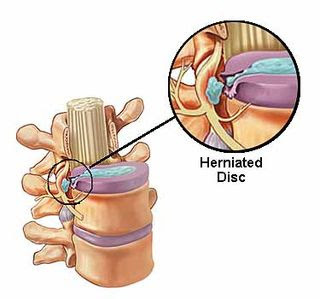 It takes approximately 3 months until a herniated disc patient can carry out the ordinary activities of daily living without the danger of recurrence. Spinal decompression utilizing the DRX 9000 in our NYC Comprehensive herniated disc treatment facility allows us to speed disc healing and repair the injured anulur fibers.